Fans have evolved like most necessities in our lives but some of the older designs still have a lot of appeal—referred to as Retro Fans. Our collection of floor fans gives you the ultimate luxury, i.e. a blend of practical, everyday usage and a design that has timeless appeal. 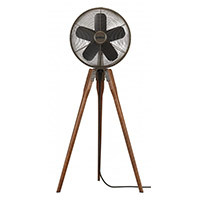 Also called Floor Fans, pedestal fans still appeal to many folks. People like their standalone, compact presentation that needs no installation or maintenance. If designed with some creativity, floor fans exude a lot of charm, raising the entire ambiance’s splendor. We present the most amazing online collection of decorative fans that can help you choose a model best suited to your taste. From classic models featuring swirled floor fans to those with accented feathered saucers and classically designed options in golden trims, we have a carefully picked inventory on offer. This includes contemporary and classics at market best prices. Floor Fans There are 9 products.